Beginner’s starter pack includes 5 hours driving tuition over three lessons 2 x 2 hours and 1 x 1 hour lesson, driving the car on your first lesson Plus Our Completely Free Comprehensive Theory Test app covering the multiple choice Theory test, Hazard Perception Test and the Practical Driving Test with over 25 completely up to date video tutorials showing you how to reach Practical Test Pass standard. 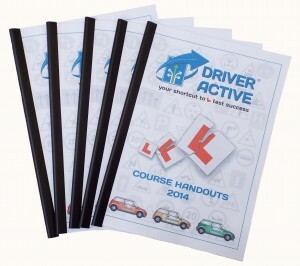 Also included is this colourful 56 page Driver Active Handout so you can learn as much as you can in-between your practical driving lessons this saving time on unnecessary explanations in the car sitting at the side of the road and this will give you more time practicing each lesson. Your lessons will be much more effective because you already have an understanding of the theoretical aspects of what you are trying to do by studying the Driver Active Handout, this will accelerate the learning process with the result being you will learn to drive far more quickly than you would otherwise. Stuart’s Driving Tuition reserves the right to amend lesson prices, change or withdraw special offers and discounts at any time without prior notice. See full Terms and Conditions.